A Dad And His Kids Happily Play Video Games Together. They Have To. 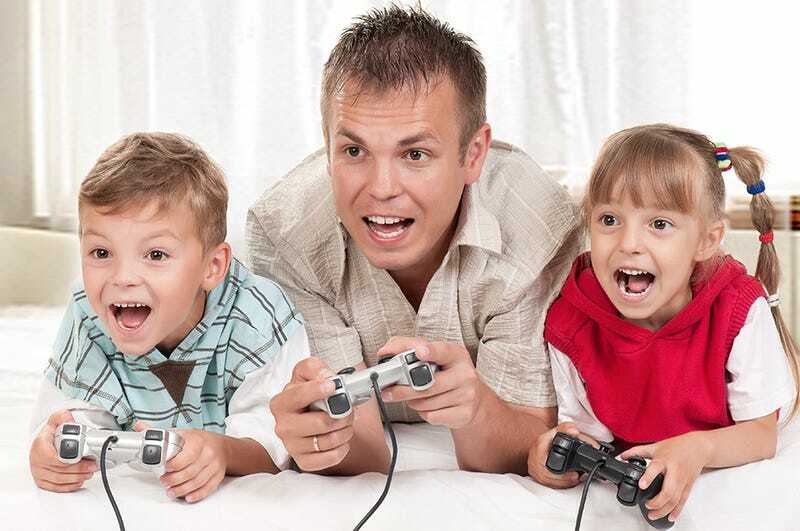 This is an image of a happy family; a father and his two adorable children bonding over a video game. It's a stock photo, of course. Their excitement is fake, their game controllers disconnected. It's cheap theater, but I have to believe that somewhere in the country a genuine version of this scene is playing out — I am tired of tales of domestic gaming tragedy. I'll call them the Andersons. The dad's name is Derrick. He works a third level support job at a prominent tech company. It's Saturday afternoon, the day before Easter, and he's watching the children while his wife — Stephanie — fills straw baskets with colored plastic grass and fanciful things containing marshmallow and chocolate. Nicholas and Audrey — those are his children — are engaged in one of Nintendo's Mario Party games. The PlayStation controllers aren't plugged into anything, so they might as well not be plugged into a Gamecube. Derrick would rather be getting in some Battlefield 4 on the imaginary Xbox with his slim, attractive coworkers, but Nick and Drey's laughter is too infectious. Grabbing a third PlayStation controller, he scoots in between the two and starts to play. Such a well-adjusted, loving family, sharing and fostering each other's interests. That kind of behavior will likely never score them a prominent story on the evening news, but they don't care about such things. They've got Derrick and Nicholas and Audrey and Stephanie. And I've got them — at least this perfectly posed portrait of them — to inspire me. My children are too young (and male) to be Nicholas and Audrey, but one day we'll get there. Our room won't be pure white, and our game controllers won't be fake, but we'll laugh and play and revel in our own company. We're a family. So when my young children fight or scream, interrupting whatever I might be working on, I'll think of the Andersons, working out their problems peacefully in their crisp, spring-fresh outfits. And when the stress of work and finances and society in general drive me to the point where I just want to hide away from the world, I'll follow the example of Derrick, embracing the fact that his life was no longer about only him the moment Nicholas (he's older by a year) was born. And when I read the umpteenth story about a father allegedly murdering his infant child because he was busy playing video games, I'll remember the countless Anderson households around the world, finding comfort in their inconspicuous ideal.